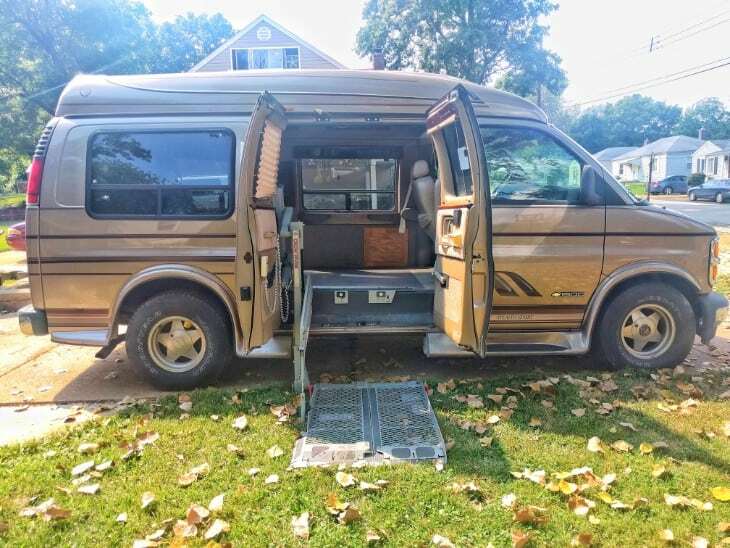 The van we bought was a 1996 Chevy Express high top conversion van with a wheelchair lift. 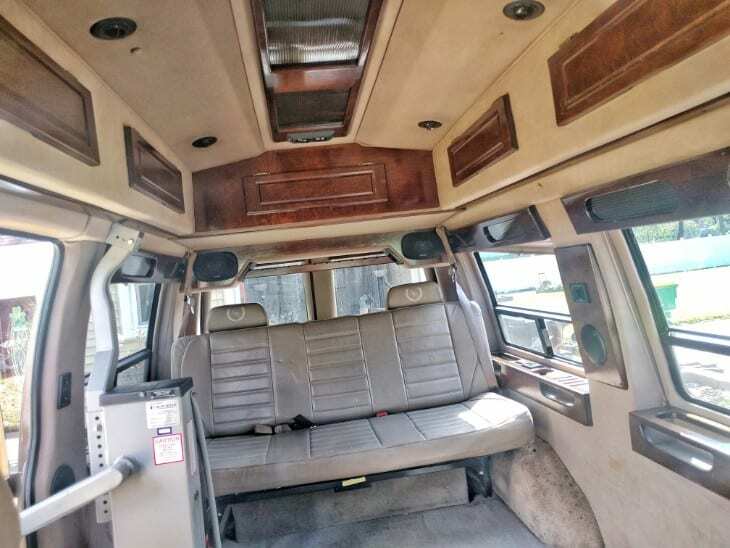 The good thing about buying a van like this is that many of them have some pretty nice amenities – leather seats, power windows and locks, etc. – and, of course, the high top. While we can’t fully stand up in it (or, at least, John can’t), it’s still much better than dealing with the lower roof of a standard van. 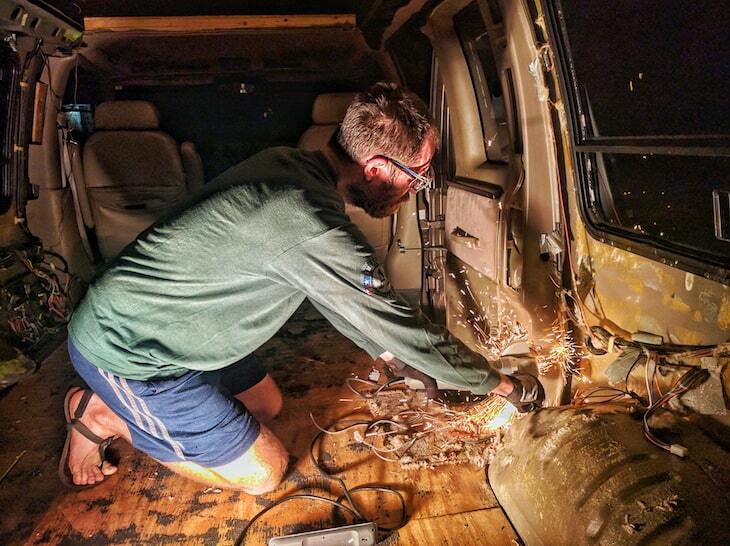 The bad thing about buying this type of van is that you need to gut it before you do anything else. 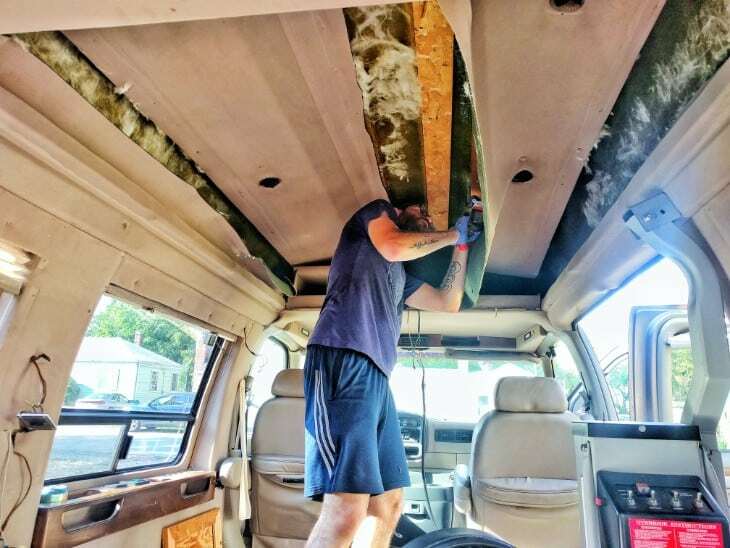 Gutting our van didn’t end up being too difficult, but it still took up a few days of our time and energy when we could have jumped right into building if we had bought something like a work van. And we made some mistakes along the way that caused us some headaches later on. 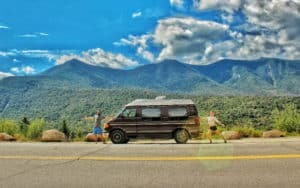 When we first got the van it was fully decked out with a TV, VHS player, speakers, fake wood accents, multi-colored LED mood lighting, the whole shebang. It was almost a shame to rip apart something so nice, but we needed to put in insulation, wiring and our own customizations so it all had to go. We began taking everything out as soon as we got the van home. We took our cordless drill and ratchet drive screwdriver and just started unscrewing every screw we could see. Before we knew it we were removing whole panels from the walls and ceiling. It was actually much easier than we had anticipated. 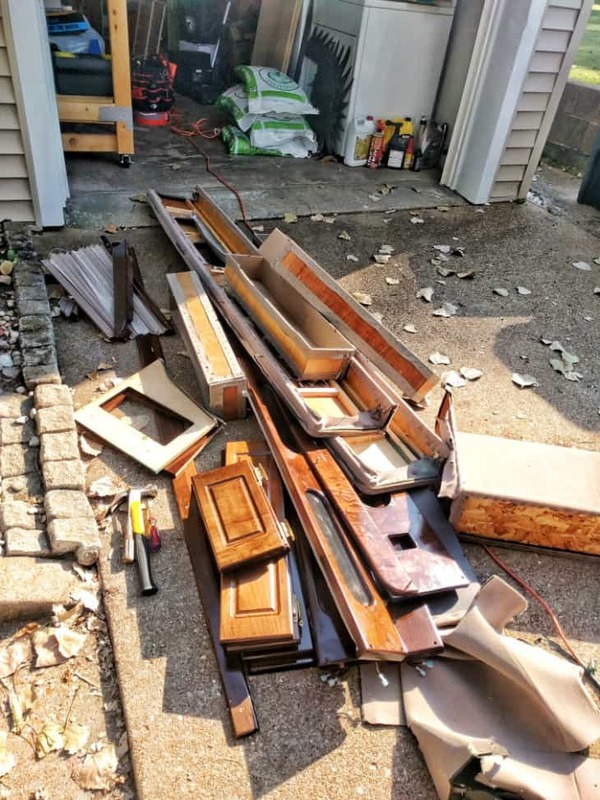 Removing the larger items like the built-in cabinets and the TV was just a matter of removing a few screws and unplugging some wires. 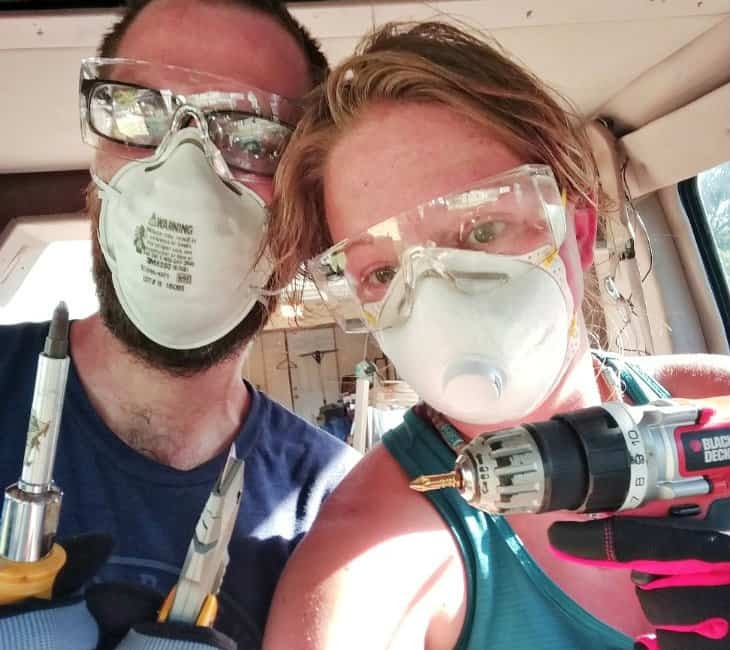 And we got to have a little fun along the way smashing things with hammers and working together to yank sections out of the van and throwing them into the driveway in triumphant glory. 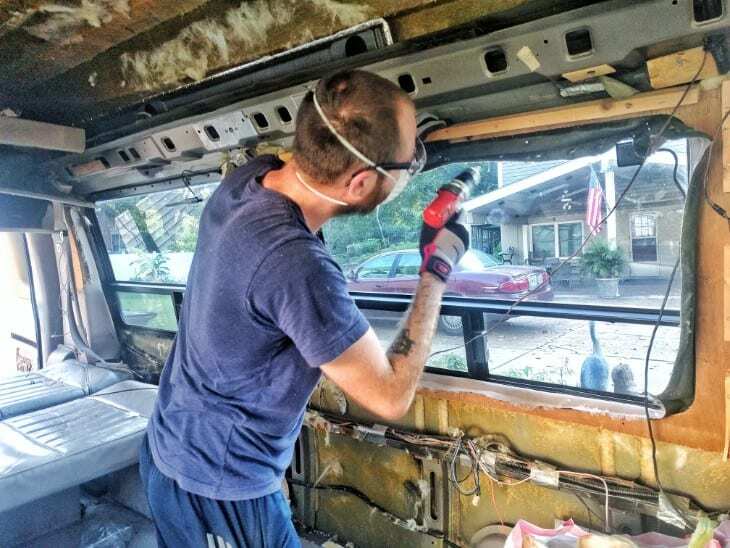 Our first challenge was taking out the rear bench seat. This was wired to an auxiliary battery so it could fold flat with the touch of a button. 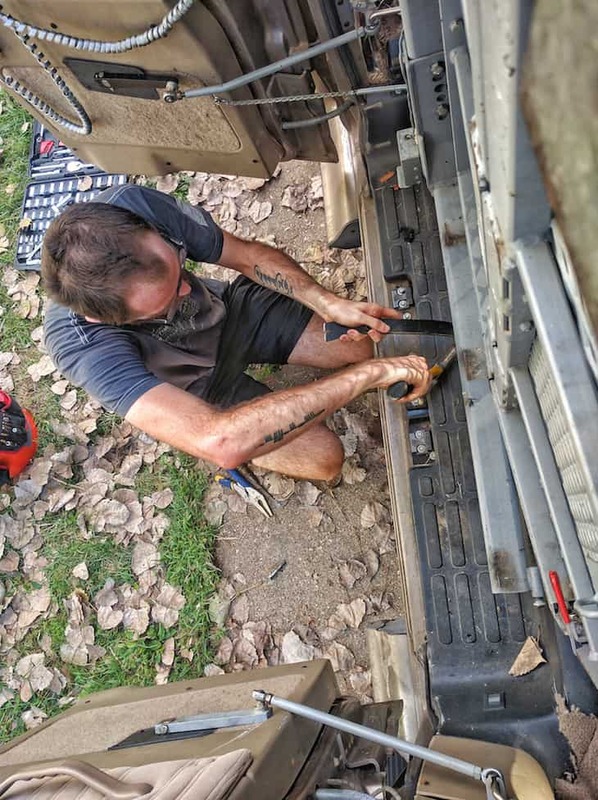 We first took apart the wiring then tried in vain to undo the bolts holding it to the floor. These things would not come out. Finally our neighbor pointed out that it was probably bolted directly to the vehicle from underneath. John shimmied under the van to take a look, and sure enough there were bolts coming through the frame. Once we figured that out it was just a matter of teaming up to remove the bolts. 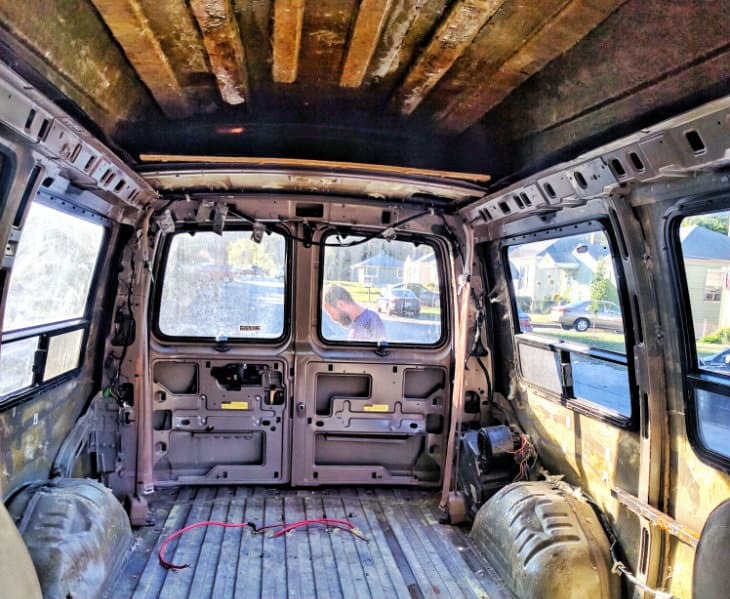 Once we got everything out of the van we tore up the carpet and removed the plywood subfloor. Then it was just the wiring and the wheelchair lift remaining. The wheelchair lift seemed intimidating so we tried to do everything possible to avoid removing it ourselves. We had read online that others had success selling their wheelchair lifts and having the buyer remove them, so we posted ads on Craigslist and Ebay. We also looked into donating it to a nonprofit. But no one was interested in an old used wheelchair lift, and we didn’t have time to halt our van build for long. 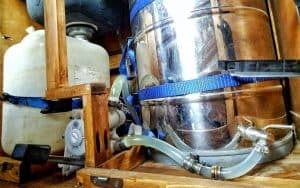 A friend of ours who is working towards living the same lifestyle told us he had removed a wheelchair lift from his bus. He came over with his angle grinder to help us remove ours, and it was actually much easier than we expected. It took us less than two hours to take the whole thing apart and get it out of the van. Where Does All This Wiring Go? Now we just had the wiring to deal with. 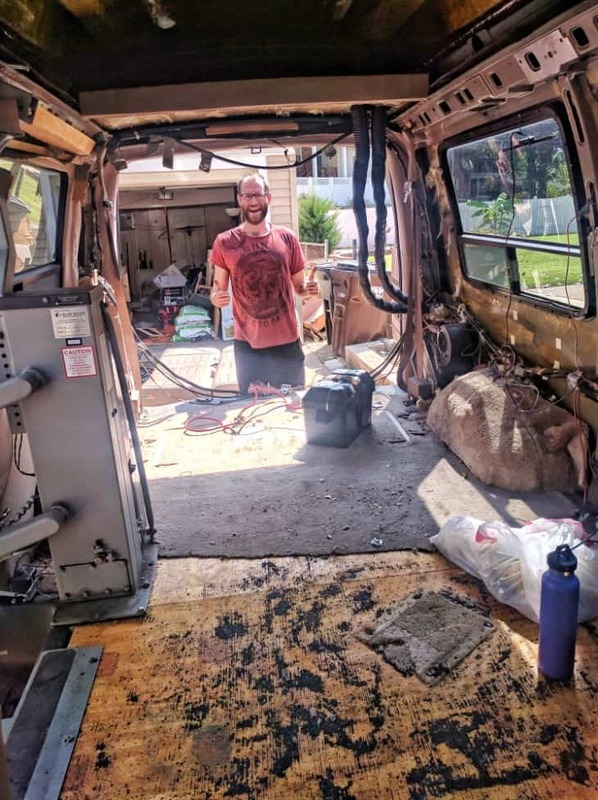 When we gutted the van, we unplugged everything without giving it much thought, so we had a nest of wires and no clue where they connected to. 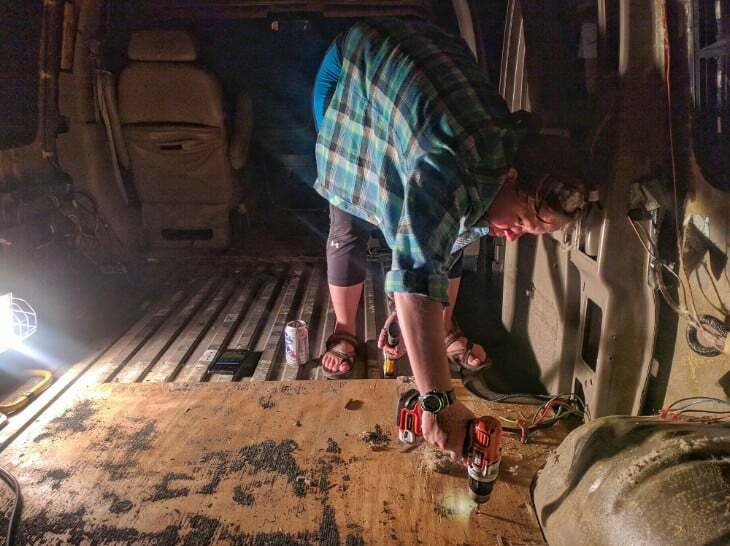 Since we didn’t want a bunch of extra wiring in our van, we spent a couple hours figuring out what we needed and taking out everything else. 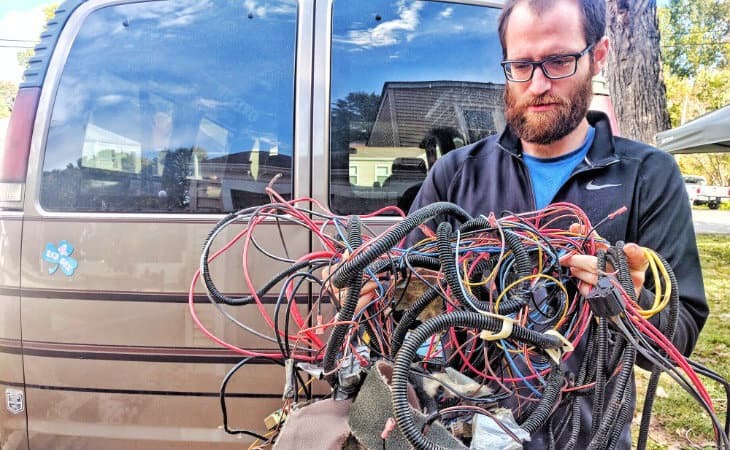 This could have been much easier if we had labeled the wires when we gutted the van. That way we would know what was part of the vehicle and what was just extra wiring. It’s easy to get carried away ripping stuff out, but taking a little extra effort to label everything can save you time later on. The whole gutting process ended up being relatively simple. 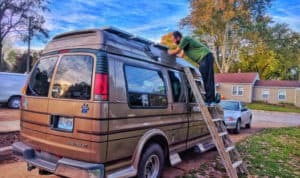 And we were excited to get on to actually building our van into a home! Label all your wires! This will help you figure out what’s vital (like tail lights) and what was just part of the conversion (like mood lighting). Some parts may be bolted to the frame from underneath, so if a bolt is really giving you trouble take a look under the van. We want to give a massive shout out to all of you for all of the love, support, shares, comments, etc we have received this past week in response to our first blog post! We can NOT thank nor love you all enough! You are all seriously the best! We are so excited to have you all join us on this new adventure and life transition! Don’t forget to follow us on Instagram: @gnomad_home and on Facebook at: Gnomad Home. Hit us up for any questions, comments, suggestions, etc! We want to hear everything! Love and light to you all! Hi!! Can you tell me what you did to seal up the holes you made in the floor when you removed the frame! Ps. 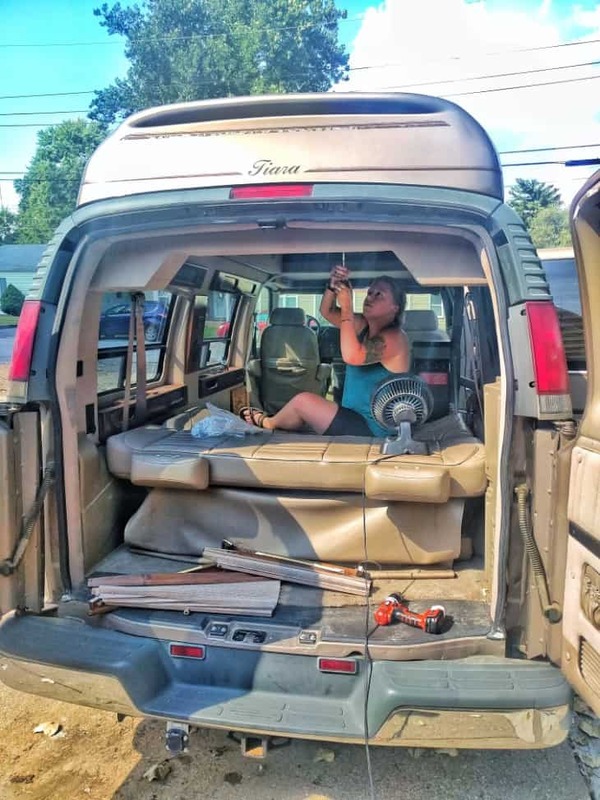 We love your blog and are going to be following a lot of your posts while we convert our 94 ford econoline conversion van! Thanks for being so awesome!!! Glad you enjoy the blog and good luck with your build! So I have the gmc that is just like the express. In fact, most of the parts are interchangeable. The top is also raised and have been considering stripping it out. Excet for the top! Is there any reason other than needing to insulate that I really need to.strip out the top? I don.t plan on visiting any cold areas with this van. Hey Barbara, if you’re happy with the factory interior of your van then you definitely don’t need to strip it out. We gutted ours because we wanted to control how it was insulated, and also because we wanted to fully customize our interior with wood. 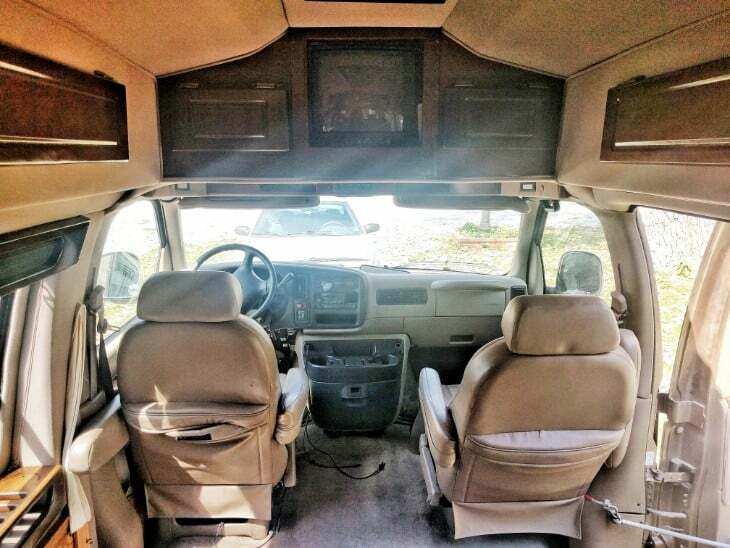 But there are plenty of vandwellers who leave in the factory interior and just build it out with their own furniture. It’s totally up to you, and if you’re not planning on visiting cold areas then the factory insulation should do fine. If it ain’t broke, don’t fix it! Looks really good! My girlfriend and I are in the process of doing the exact same thing right now. What did you do with the wires that you didn’t need? (How did you remove them?) Did you cut them and wire cap them, or did you follow them all the way to the source and remove them from the battery? We are leaving some of the lighting on the top and the bundles of wires get quite complex when they all meet at the battery so we don’t know the best way to do this. 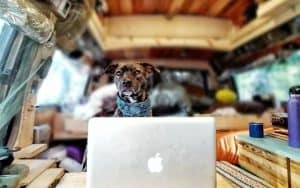 Hi, I love all your tips and getting to read about the process of your van build. My hubby and I are just starting out and are very excited. I love how your home turned out and am trying to do the same thing. 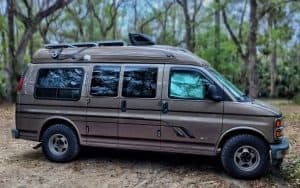 We have a ’96 chevy express conversion van similar to yours. I was just wondering how you guys got the seat rails/bolts out?? We have two rails. Any tips you can pass along would be wonderful. Happy roaming. Hi! I am curious as to what the roof (ceiling) was like once stripped? I have gutted a van with the same profile, but didn’t touch the inside roof. Did you find wasted space under the fabric/ lights? Were you able to get any additional height? I dont want to go thru the work if nothing is really gained. Once i cut into that fabric there is no turning back. I have a 1994 GMC Vandura Tiara: where is the auxiliary battery? 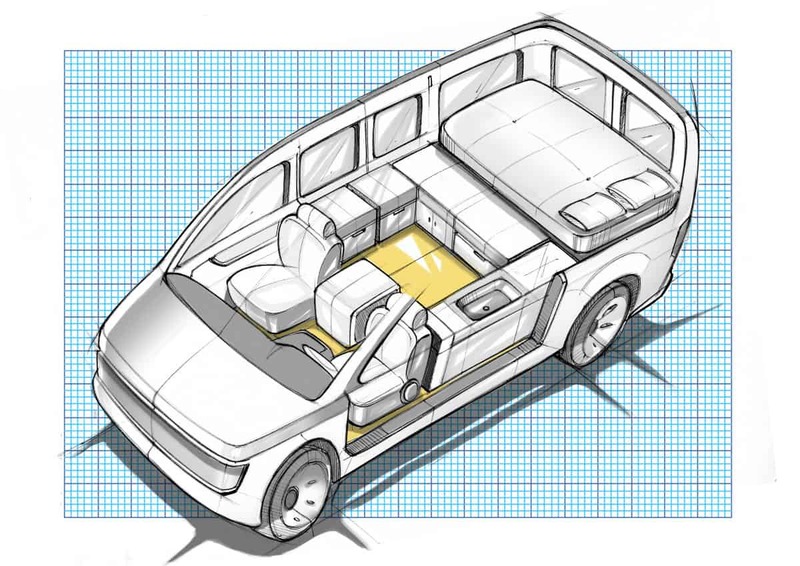 I want to remove the bench seat but don’t want it connected to the battery when I do it. Any tips on the removal? I see that the rear ac/heat is still in the vehicle. Is it still hooked up and functional? Or did you remove the lines running to it? 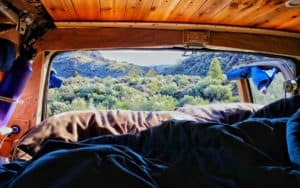 I am in the process of building my own van(2002 gmc savana conversion van) and want to remove this thing. But, I am a bit nervious about removing the lines that run to it from the refrigerant and coolant.